Seven yearlings from the first crop of 2015 Triple Crown winner American Pharoah passed through the sales ring on the first night of Fasig-Tipton’s annual The Saratoga Sale with two bringing the highest two prices of the session and both topping the $1 million mark. Hip No. 26, a chestnut filly out of multiple grade 1-winning millionaire Life at Ten (by Malibu Moon), who is also the dam of grade 2-placed Singing Bullet, was the session topper at $1.2 million. Larry Best signed the sales slip on the Ontario-bred in the name of his OXO Equine. 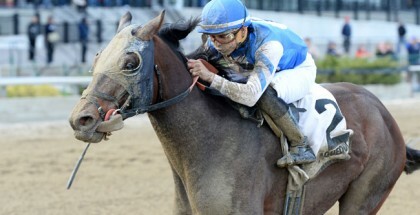 She was consigned by Gainesway. 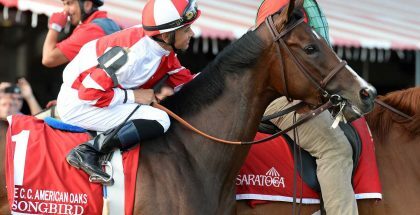 Best uses several trainers across the country, including Hall of Famer Jerry Hollendorfer in California and Chad Brown in New York. The Adena Springs-bred filly was a $500,000 Keeneland weanling purchase last year. The hammer fell at $1 million for Hip No. 62, a bay New York-bred colt out of the unraced Touch Gold mare Party Silks, making him a half-brother to grade 2 winner Upstart. Hall of Fame trainer Bob Baffert and M.V. Magnier were listed together as the successful bidders, with Baffert selecting the colt and Magnier paying for him. Magnier is the son of Coolmore Stud principal John Magnier and Summerfield (Francis and Barbara Vanlangendonck), as agent, consigned the colt. Baffert knew exactly what he was getting with his latest seven-figure purchase. “I sort of like his sire,” the two-time Triple Crown-winning conditioner joked when asked what about the colt he liked most. Hip No. 10, a colt out of JZ Warrior (by Harlan’s Holiday), brought one of the highest bids of the sale at $800,000 but failed to meet his reserve. 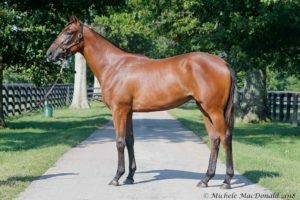 A bay filly, who is the first foal out of Margate Gardens (by Speightstown), cataloged as Hip No. 35, brought $325,000 from Lothenbach Stables and came from the consignment Runnymede Farm. 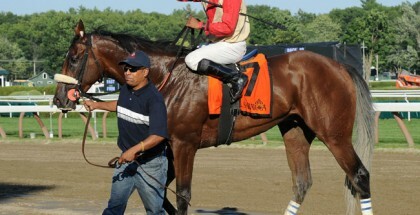 Margate Gardens is a full sister to grade 3 winner and successful sire Bridgetown. 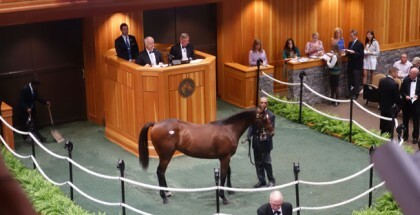 A final bid of $260,000 from Jerry Crawford of Donegal Racing was sufficient enough to secure the purchase of Hip. No. 9, a chestnut filly out of JZ Now (by Tiznow). Hip No. 3, a bay colt out of Jewliana (by Smart Strike) sold for $235,000 to Carl Vaccarezza. 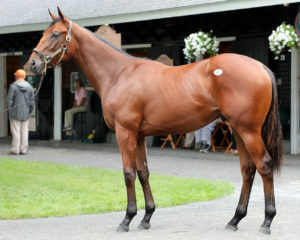 She was consigned by Taylor Made Sales, who also consigned American Pharoah as a yearling at this sale in 2013. Vaccarezza also signed the $200,000 sales slip for Hip No. 104, a chestnut filly out of She Be Classy (by Toccet). She was bred by Nancy Mazzoni and consigned by Bluewater Sales, agent.